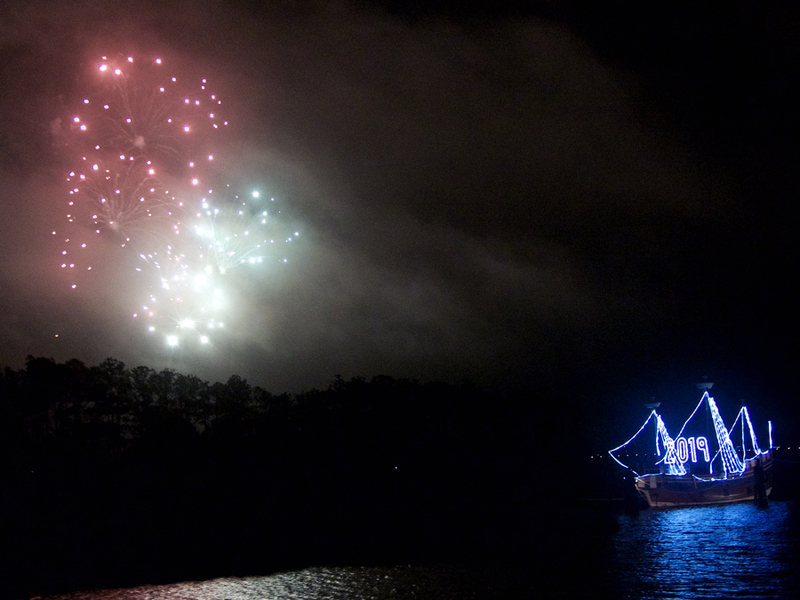 Spectacular fireworks welcomed in the New Year in Manteo. Manteo, New Year’s Eve Celebration and oh, what a difference a year makes! With temperatures hovering in the low sixties and a gentle breeze off Shallowbag Bay, the celebration bringing in 2019 could not have been much more different that 2018. Last year…that gentle breeze was was a 12 mile an hour wind with occasional gusts, the temperatures never did quite get to 20 degrees and there were snow flurries. There was a brief light shower last night, but the rain arrived late in the evening and it came and went very quickly. When Cory Hemilright of Bluegrass Island and Tod Clissold owner of Poor Richard’s came up with the idea last year, this is what they had in mind. The evening was a wonderful celebration of many of the things that are best about the Outer Banks. A very nice touch, though, that was fun and funny was dropping a lighted ball from the old Dare County Courthouse at 8:30 so the kids could get in on the fun. OK, the timing might have been just a bit off and there might have been a brief technical delay, but hearing all those little voiced counting down from ten and the squeals of joy when the ball lit was a true joy. The Original Rhondels provided the sound track fo the evening and their blend of classic beach music with a couple of modern songs that matched their stye was perfect. They began playing soon after the ball dropped and kept playing right up to midnight. Many of the parents opted to keep their children with them waiting for the fireworks that had been billed as the largest New Year’s Eve pyrotechnics in the state. Maybe they were the largest…maybe not…but they were spectacular and were the perfect way to welcome in the New Year. Now that we’re into 2019, be sure to book your Joe Lamb, Jr. & Associates vacation as soon as you can for the best selection of our Outer Banks properties.